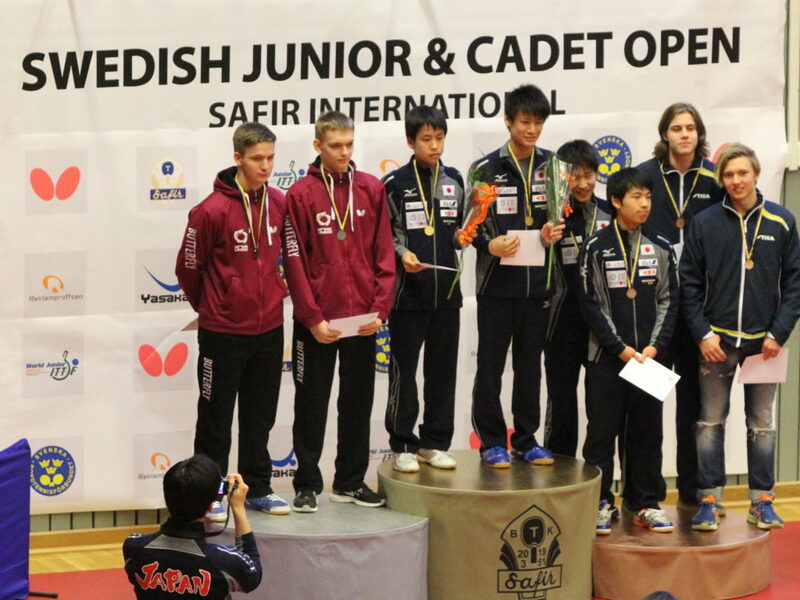 Maki Shiomi and Shunsuke Togami were the winners not only in the Girls' and Boys' Singles, but also in the doubles categories at the ITTF World Junior Circuit Swedish Junior and Cadet Open in Orebro, Sweden. Paired with Wong Chin Yau, Maki Shiomi won the Junior Girls' Doubles and an all Japanese pair of Shunsuke Togami and Kazuki Hamada won the Junior Boys' Doubles title. First seeded in Junior Girls’ Singles, Maki Shiomi, was the only player competing from Japan, which is not what we have seen in the previous years. Generally, Japan arrives with a big contingent, but in Orebro, Shiomi had to find a new partner. Thus, she paired up with Hong Kong’s Wong Chin Yau, and together, they proved to be a brilliant combination. In the final they played the second seeded pair, Chen Xingtai and Ning Jing from Azerbaijan. The Japan/Hong Kong pair won in three straight games (11-6, 11-8, 11-5). Interestingly, the winning pair just lost one game on their way to the victory. “I think I had a good partner. That’s why I could win,” said Wong Chin Yau. Last week, at the ITTF World Junior Circuit French Junior and Cadet Open, she played the doubles with Japan’s Yuko Kato and together they were the runner up, losing the final to Miyu Nagasaki and Maki Shiomi 3-0. But the next week in Sweden, Wong won her first title in an ITTF World Junior Circuit and she was extremy delighted over the victory. “I speak Chinese and English. The coach speaks English and I have played some more doubles with Japanese girls and I can understand a little bit,” said Wong Chin Yau. In the Junior Boys’ Doubles, the finals was much closer game. Japan’s Kasuki Hamada and Shunsuke Togami outstaged the Russian pair of Ilya Isakov and Anton Kotov in a full five games duel (9-11, 11-6, 6-11, 11-5, 11-9). To everyone’s surprise, both the winners and the runner up pair were not seeded in the draw. Yet, the match was as intense as possible for both the pairs. In the third game the Russian pair lead a few points but turned that set to victory, which seemed to be a deciding moment of the game. But Kasuki Hamada and Shunsuke Togami, wanted something else. In the forth game they were down a few points but played very strong and with 11-5 they succeeded winning the deciding game 11-9. “My partner helped me. I’m just 14 years old and my partner is in the final in the junior boys’ singles, this helped me do well” said Kasuki Hamada. In the semifinal they beat Japan’s Aoto Asazu/Takeru Kashiwa which was also a big surprise though they were down 2-0 and won the three remaining games with just two points, 11-9, 13-11, 11-9. The title winners won 11-7, 11-9, 11-9, 13-11, 11-9.